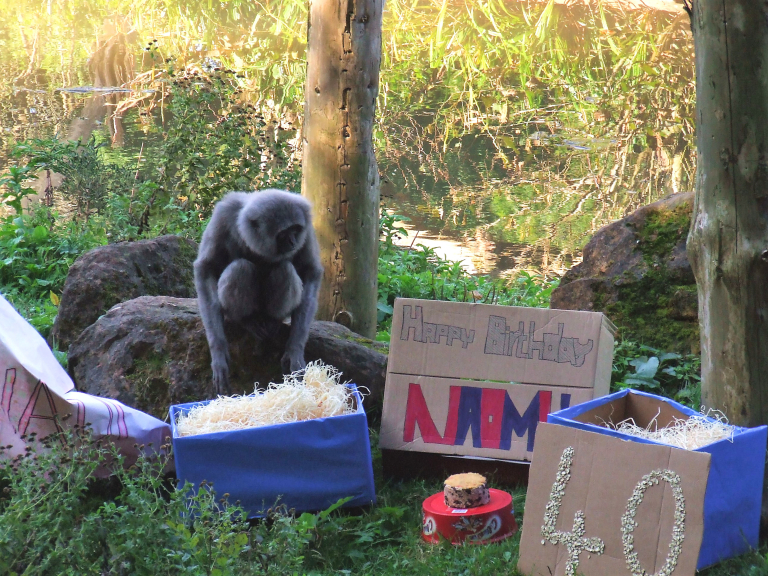 It was a party that was always going to go with a swing - Naomi the grey gibbon has turned 40. Naomi, who lives at Paignton Zoo Environmental Park, celebrated with a gibbon-friendly cake made by her keepers using ingredients such as primate pellet and carrot. The box of wood wool contained a lucky dip of grapes and small fruit bits. Unlike other gibbon species, there’s no sexual dimorphism; male and female grey gibbons look the same – to us, at least - with grey or brown fur and a ring of lighter colouring around the face. Adults typically weigh between 4 and 8 kilos, making it one of the smaller gibbon species. The lifespan of a gibbon is roughly 30 to 35 years in the wild or 40 to 50 years in zoos. The oldest known gibbon was a grey gibbon named Nippy at Wellington Zoo in New Zealand, who was said to be 60 when he died in 2008. These days Naomi lives a quiet life. She has been paired up and has bred in the past; she was not particularly sociable with her last male partner and in any case there has been a lack of available males. A gibbon of her advanced years is probably past breeding age. She shares her island home with female Bornean orang utan Gambira. Both species comes from the island of Borneo. Animal staff describe Naomi as friendly and sedate, unless she thinks you aren’t looking, whereupon she will try to grab you to catch you out. The grey gibbon (Hylobates muelleri) is a species of tropical forest, living on fruit, leaves, buds, flowers and birds. Although threatened by habitat destruction and classed as Endangered in the wild, there is no formal breeding programme as yet. Paignton Zoo Environmental Park is a registered charity. For more information go to www.paigntonzoo.org.uk or ring 01803 697500.